Anglian Compressors are specialists in the supply and installation of a comprehensive range of market leading air compressors, competitive and professional compressor servicing and the supply of ancillary equipment giving you a complete range of solutions for your business. As the Authorised Premier Distributor for Atlas Copco industrial air compressors for the last 30 years we have a wealth of knowledge and advice which is available to you. Atlas Copco is one of the most efficient and reliable compressors on the market place today. One in four air compressors sold in the world is an Atlas Copco Machine. Additionally we carry comprehensive stocks of air accessories, air purification products, pipe fittings, hoses and associated equipment all quality products at great value prices. Our Service Department offer a genuine twenty-four hour breakdown service and tailored service contracts to suit any requirement which means total peace of mind for you and your business. We strive to always be professional, knowledgeable, and diligent while working responsibly and safely. We pride ourselves on the quality of our Servicing and always use genuine manufacturer parts on any machine we service. The team of skilled Service Engineers have a wide knowledge of working on many different makes and designs of air compressors. Producing air can be expensive and with current energy prices energy saving is at the fore front of many customers minds. It is estimated that the lifetime expenditure of an air compressor is made up with 75 per cent of energy costs. We offer a variety of energy saving ideas and solutions and would be happy to shares these with you. These vary from leak detection, equipment set up, efficiency of existing equipment and many more. Please contact us for further details. As a Company we are able to offer you a complete turn-key package for design, supply and installation of all air compressors, dryers and filtration including all pipe work and electrical systems. We are also able to advise, supply and install equipment to enable you to comply with the 1991 Water Resources Act regarding contamination of storm drains and water tables. With the latest technology in compressed air sampling equipment, both for air quality and compressor monitoring data, we are able to test breathing and process air systems where product contact is likely, to ensure compliance with the latest regulations. Compressor monitoring data enables you to ensure you have the most cost-effective system for your processes. We are registered to BS EN ISO 9001. 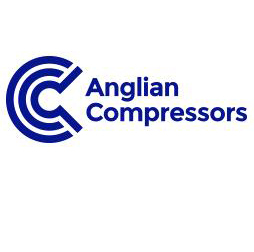 Visit our web site at www.angliancompressors.com for more information on our products and services.